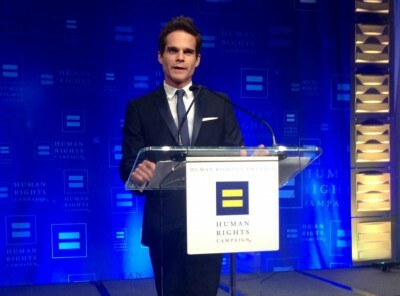 It was a week ago that Young and the Restless star Greg Rikaart received the Human Rights Campaign Visibility Award in New Orleans and I’ve just located the presentation on YouTube – posted by HRC. Love the clip reel of Greg as Kevin Fisher on Y&R and guesting on Bones, Dawson’s Creek and The Closer, a nice red carpet interview at the GLSEN event, a few PSAs and even a brief glimpse at a Greg In Hollywood page! Greg, an Emmy winning actor, came out publicly last year on the day of the Supreme Court rulings on DOMA and Prop. 8. But he was already speaking out publicly for LGBT equality. But he is still haunted by the fact that he bullied a classmate named Josh. But through Facebook, he was able to find Josh and he sent him a very belated apology. Greg told the crowd about the circumstances last June 26 that led him to come out publicly via Twitter. He reveals for the first time that he and his partner, writer Robert Sudduth, had been drinking wine with a barbeque and washing their dog with tomato juice after he had been sprayed by a skunk when inspiration struck. 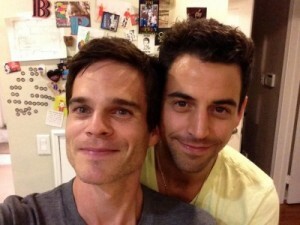 The couple met at a party in North Hollywood and have been together since 2005. ‘We’re not married, yet. 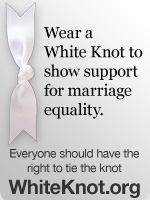 But if we were to get married today, we’ve got 19 states where we can do that.